LANSING – Nearly a quarter million fewer coho salmon will be stocked in the Grand River at Lansing in future years if a state plan to release those fish downstream moves forward this spring. The new strategy is expected to improve coho fishing and provide a better return on investment, according to state officials. Hanshue and others say improved survival means improved fishing. 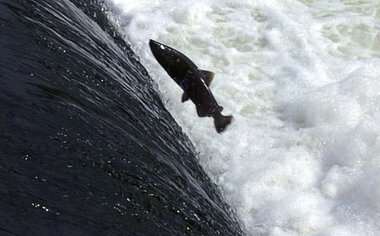 Fewer fish will be chewed up by hydro-electric turbines or by lurking predators. But what is obvious to fish managers is not necessarily certain, some anglers say. And the value of the Lansing fishery is not to be toyed with carelessly. It has tourism potential and provides a unique salmon fishing experience in a region dominated by warm water species. “There’s no doubt that planting fish 100 miles from the lake is a tough go, but one thing about coho is they are the best at finding their way upstream,” said Jim Bedford, of Lansing, a veteran Grand River angler. “If we have a good fishery with less fish and save money, that makes sense. The Grand River is stocked annually with 315,000 coho yearlings, making it the second largest coho stocking in Michigan. Only the Platte River gets more. That is where the state’s coho salmon brood-stock is maintained. Lansing currently gets 295,000 coho yearlings annually; another 20,000 are stocked downstream at Lyons. The total cost is $626,850. Fish managers consider it an expensive effort. Camera studies at Webber Dam in 2001, 2002 and 2008 showed less than one percent returning that far upstream. Webber is third dam upstream from Lake Michigan and the fourth dam downstream from Lansing. The new strategy shifts the bulk of the stocking downstream to Lyons, shortening the distance to Lake Michigan and avoiding the turbine problems. Lyons would get 240,000 coho yearlings. The Rogue River, in Kent County, would get 25,000. Lansing would get only 50,000 yearling cohos. Anna Werner, the owner of Grand River Bait and Tackle in Lansing, questions the state’s assertion that fishing in Lansing could improve. Werner’s business does not depend on salmon. Their arrival in Lansing is too unpredictable, she said. But anglers enjoy fishing for them and many she works with have a low income. They cannot afford to drive an hour west to fish them closer to Grand Rapids. Bedford said coho survival might be improved by dealing with known structural issues at Webber dam that trap returning salmon and keep them from going upstream. Other problems at Portland, that have since been fixed, also hindered upstream migration. Better coordination is also needed with Consumers Energy, he said. They utility turns off its Webber dam turbines in April so coho smolts can get downriver safely. Bedford suggested using volunteers to monitor the smolt migration so timing for the turbine shut-down is not haphazard. Downstream anglers are happy about the plan. Bob Strek, of Grand Rapids called it “a fantastic idea.” He regularly fishes the river. Dennis Eade, the executive director for the Michigan Steelheaders and Salmon Anglers Association, said he supports the change. The new stocking strategy will be put into effect in 2013, Hanshue said. It is to be taken up by the Natural Resources Commission. This entry was posted in Uncategorized and tagged Coho, DNR, Fishing, Grand River, Salmon. Bookmark the permalink.